Magnetic resonance myocardial perfusion imaging (MRMPI) based on adenosine-stress cardiac magnetic resonance (CMR) is increasingly proposed for non-invasive detection of relevant coronary artery disease (CAD). However, little is known about the impact of the normal variability of coronary anatomy on the diagnostic performance of adenosine stress CMR. Aim of our study was to examine whether left-dominant or right-dominant circulation as normal variations in coronary anatomy account for false-positive results of MRMPI in the assessment of CAD. Over a five months period, we included consecutive patients with suspected CAD undergoing MRMPI, who were diagnosed as having myocardial ischemia during adenosine-stress perfusion and subsequently had ruled out significant CAD in coronary angiography (CA). Patients were examined in a 1.5 T whole-body scanner (GE Signa Excite). After three minutes of adenosine infusion (140 μg/kg/min), myocardial first-pass sequence in 4–5 continuous short-axis orientation using Gadolinium-based contrast agent was performed (0.1 mmol/kg, Omniscan, GE Healthcare Buchler). Images were visually analyzed by two experienced investigators in consensus. A perfusion deficit was regarded relevant if affecting more than 1/3 of myocardial wall thickness in at least two neighbouring myocardial segments and persisting for more than five heart beats after maximal signal intensity in the LV cavity. 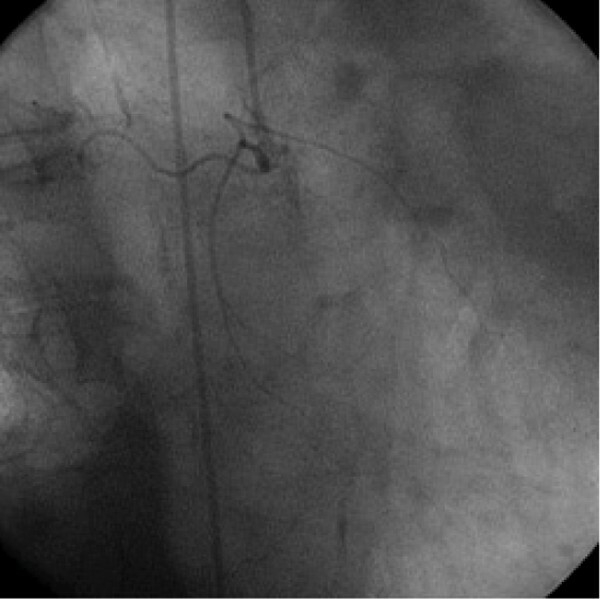 Significant CAD was defined as luminal narrowing of ≥ 70% in CA. During the period of observation, significant CAD was invasively confirmed in 80 out of 99 (CMR specificity: 81%) and ruled out in 19/99 patients with previous ischemia in MPMRI (false-positive CMR exams). Indication for CMR in these 19 patients was either symptomatic angina (Canadian Cardiovascular Society [CCS] II in 9 [47%] and CCS III in 2 [11%]) or evaluation of myocardial ischemia in CCS I patients presenting with arrhythmia and/or equivocal stress tests and underlying cardiovascular risk factors (n = 8 [42%]). In CA, variations in coronary anatomy were observed in 7/19 [37%] patients: left-dominant circulation in 2/19, right-dominant in 5/19. 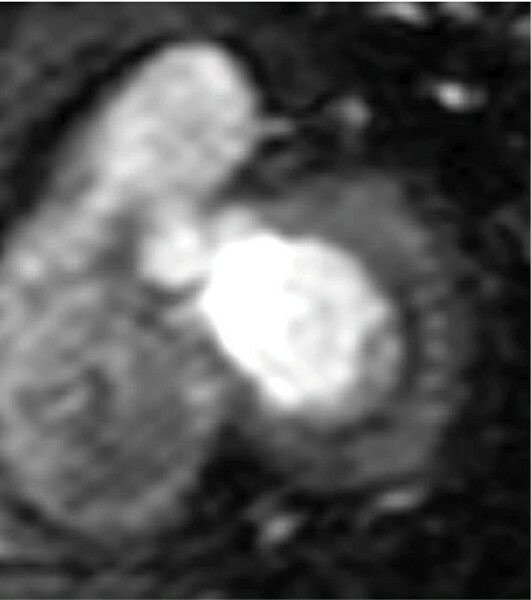 Figures 1, 2, 3 show inferolateral ischemia on MPMRI in a patient with left-dominant circulation and small right coronary artery. 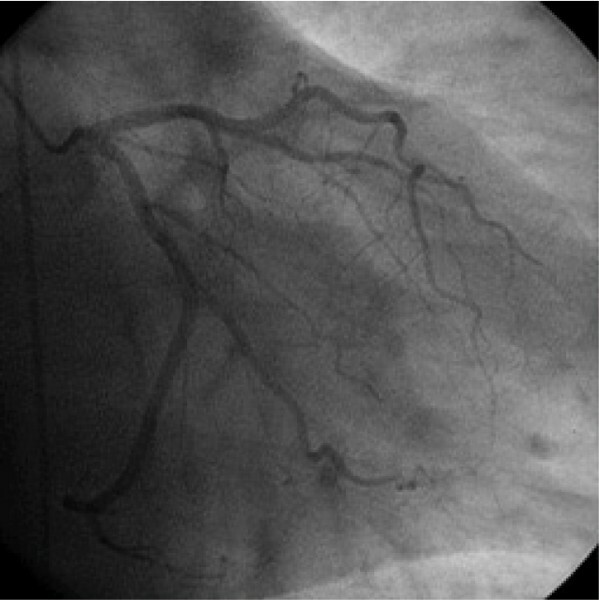 Normal variations in coronary anatomy such as left-dominant or right-dominant circulation may account for false-positive results of MRMPI in the assessment of CAD. Thus, non-invasive visualisation of a dominant versus balanced coronary artery system in addition to MRMPI could potentially reduce the rate of false positive CMR results and the rate of subsequent purely diagnostic CA.